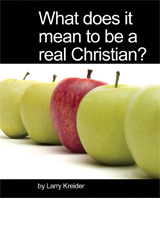 House to House Publications » What Does It Mean To Be A Real Christian? Home / Basic Christian Resources / What Does It Mean To Be A Real Christian? Purchase 100 or more of this item and receive 50% off retail price. Enter: 100 Booklets in the Coupon Code box in the shopping cart. Use this booklet as a tract to start a conversation about Christianity. With its clear presentation of the gospel, it helps people find their way in their walk with God. It doesn’t stop there, however. It describes simple steps new Christians can take to grow in their relationship with Jesus Christ day by day. It opens the way for you to share faith in Christ and helps the new Christian to grow up spiritually. Check out another easy-to-share booklet: How Can I Be Filled with the Holy Spirit?